INSPIRATION: Dessert plates found in the clearance section at Tuesday Morning. Just $1.99 for each set of 4!!! The rim of the otherwise pink, red & white dessert plates is chocolate brown. Valentine’s Day definitely = chocolate, so chocolate brown 85-in. tablecloth over a 108-in. round one it was! The place setting begins with hot pink Bormioli Rocco Inca glass chargers purchased in a frenzied shopping spree a couple of years ago. Plain white Corelle plates for the entrée come next, topped off with the dessert plates in 3 of the 4 designs. A starched white cotton napkin drapes off the side of the table from beneath the stack. Simple stainless flatware and curvy Dollar Tree glassware completes the place setting. The vitrine holds plenty of sweet and salty snacks to munch on during the card playing portion of the afternoon. The dessert plates do quote the 1782 poem that begins, “The Queen of Hearts, She made some tarts, All on a summer’s day…“, so what would this luncheon/card party be without a few tarts? (OK, those of you with randy little minds! Don’t go there!!! 😉 ) Faux tarts are used here for demonstration purposes, but I’ll be making some using mini phyllo dough shells for the luncheon. I have created score cards for the occasion using my PC. From the looks of it, scoring is very complicated! A pretty red and pink cloisonné heart jewelry box serves as decoration for the side table. So if you have no plans for Valentine’s Day or just want to do something fun with friends, a Queen of Hearts card party might be right up your alley! I’m linking up with The Tablescaper for “Seasonal Sunday” this week and Laurie for her annual Valentine Blog Party. This Thursday I’ll be joining Susan at Between Naps on the Porch for “Tablescape Thursday” once again. Check it out to see what I’m sure will be a bevy of wonderful tablescapes from talented bloggers all around the world who join these weekly blog parties! How absolutely darling ! Love it ! Sweet! Girl you do know how to score on the mark downs!! Is card playing back? Do ladies (still?) once again gather to play bridge, hearts, canasta, etc? I thought that went out in the 60’s. But I’m in if you’re playing a little 5 card stud. 😉 This ‘scape would also be great for the Bunco Babes. Your creativity ceases to amaze me. ❤ stickers to modify the vase. No one would ever know! Juice Newton's Queen of Hearts shall be my ear worm for the day. Omg!!! I have that queen, along with the king and jack!! I bought them at hobby lobby a while ago and was going to do a card party with them too!!! I have been trying to get our game group together for it and we just haven’t been able to find a good night. Now it is going to look like I just copied you, oh dear!!! I guess I will have to play up the spades!!! Your ideas are so cute, along with those plates. I just like the way your mind works and I wish I could have seen you in hobby lobby kissing the floor!!! The card games with me are like watching the SuperBowl. I’m only there for the snacks! You scored a major bargain with the dessert plates, and yes the “girls” on the modern queen are out there!! Once upon a time we had a Tuesday Morning and it was open for less than a year. At that time I was not into my tables like I am now. I dare them to open again here in town!! I am in love, love, love with those chargers, arrrgghhhh! I know it’s not right to covet, but I want them!!! I don’t like brown, but I LOVE this! And Marlis and I will fight over that big china cabinet. What a fun table…Love the theme and your sweet little dishes you go on sale. The centerpiece is so cute and goes perfectly. I need to go shopping with you. I must have missed the clearance aisle at Hobby Lobby. My lucky day…..serving lunch to four bridge playing friends on Feb. 12th. Am in a rented vacation condo and looking for anything in this place to carry out the Valentine theme….have two tall slender vases with red hearts at the base, valentine napkins, red placemats, white dishes and will use your idea of the playing cards at each place….how clever! Bought some conversation hearts to sprinkle around on the table…..dessert will be homemade chocolate covered California strawberries….they are deliciious right now….Thank you for your inspirational site…I enjoy! I would not have thought to pair chocolate brown with pink, but in your very capable hands it works marvelously! Love the queen of hearts plates, and your pink rose flower arrangements made me swoon–we are snowed and iced in today here 🙂 You are so funny, and what tenacity to go back and eventually find what you wanted at the store–that shows pluck–brava! Too fun Alycia! I would have squealed if I got those dishes at 90% off! You “decked” out the table so cute- that centerpiece is awesome! I’m glad you got all three of the queen, king and Jack pieces! I know you’ll find something fun to do with them all. The desserts and candy look way too good! Time to party! Hi Alycia, what an intriguing idea for a Valentine’s Day tablescape! Of course: hearts, the queen of hearts, heart shaped candy, heart motif plates, the list goes on! I love pink and brown together, as the combination reminds me of flowers and chocolate, respectively! Thanks for all the beautiful inspiration and motivation to decorate, as I haven’t for years, since my daughter was little. Have a lovely week! There have many times when I have seen something, toyed with the idea of buying the object and then did not. Within the following week I end up scurrying around trying to locate and purchase the object, usually without any luck. Always follow your instincts. But your Queen of Hearts looks very regal (stickers and all). Marvelous game table for a relaxing evening with friends. Too brilliant Alycia, Queen of hearts is such a perfect take on Valentines day, love love love everything you did, especially the cards. The plates are adorable!! I probably would have done the same insane shopping, trying to grab that coveted prize, I swear that’s the fun of it all! Good job, great effort and super tables and vignettes!! Amazing table, Alycia. The dessert plates are too cute. You really lucked up on those. Our TJMaxx/Homegoods rarely has anything, except things that are chipped or broken beyond repair. Love your Queen of Hearts centerpiece and the curvy DT glasses. You’re so smart using heart stickers to cover the clubs. Glad you found the King and Jack, too. This is so fun! Love everything about it. Hubby and I love playing cards with friends. Thought we might throw a party if we don’t go out of town. I’m so glad you came to your senses and found that queen! Great move with the heart sticker update, too. 🙂 I don’t play cards, but now I want to! What time should I pop over for some fun and sweet treats? What fun!!!!! Love it all, dear Alycia! How clever and fun! 24 years ago when my mom turned 60 we had a “Queen of Hearts” party for her. She didn’t play cards so I don’t really know why that was our theme, but it was still fun! What a great post….I laughed myself silly when you went to the “tart” segment….That was me. This is so pretty and what a deal on those cool dishes!! You always do an amazing job! The queen of heart plates are adorable. Great game night table! Thanks for sharing. I could stay on your site all day, but alas, clothes must be washed sometime – ugh! I love the way you pull everything together. So creative, Alycia! Funny, how many times I’ve passed something by and regretted it and we can always take it back!!!!! Glad you found it and lucky for you there were three other stores to check out! The faux tarts looked so real I was really going to be impressed. Love your sideboard filled with goodies. Glad you found the cute plates at such a good price! Doesn’t that make you like them even more? Your tablecloth and napkins are the perfect choices to compliment your theme and darling plates. Fun table and very clever. Love these plates and the way you have carried out the theme is wonderful. Not only do I completely love this table, but I also love the stories of your shopping adventures to go along with it. I can’t believe you go those plates for 90% off! That is such a score! My favorite story, though, was the one about the great Hobby Lobby frenzy as you tried to find your king and queen, . We have only one HL store here so I would have had to “kiss” my dreams good-bye at store #1. I loved it all. I always do. You just flat out speak my table language. I’m not big on Valentine’s… really. It wasn’t a celebration I grew up with and if your Thanksgiving would be a tradition I’d welcome happily, Valentine’s or Halloween really aren’t my cup of tea. Been there, done that. Spot something, don’t pick it up, go back and it’s gone. I had a little frenzy of my own a few years back. I actually traveled the coast of Lake Erie from Cleveland to Toledo for some adorable Easter dresses on hangers (about 2″ tall) to hang on my Easter tree. Since they were 90% off, they were not available on the website. I did have some success – I know the kiss the floor feeling, too. 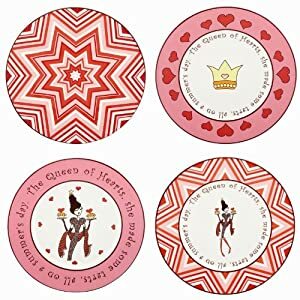 Love those Queen of Hearts dessert plates! Sophisticated and just plain fun! Perfect for a card party or anytime. Great tablesetting and party decorating. So much fun! Love this! Thanks for being a part of Seasonal Sundays. lot at Hobby Lobby and then air kissing the ground!!! You got some great buys and bargains, too. Your table is fun, creative and yummy with all the treats. Happy ❤️ Day! p.s. This is my third try at leaving a comment. It wouldn’t take so I’m crossing my fingers this time. Yea, it worked!!! Woo hoo!!! I would say you were one very lucky girl at both stores! I love the plates. They are so fun and sure make an exciting table. Your queen is stunning and so glad that you had 3 Hobby Lobbies to choose from. Isn’t it so fun to go treasure hunting and find some treasures. Looks like such a fun table and party. Alycia, I loved your story of tracking down your Queen figurine. Doesn’t that just kill ya when you go back and something you passed up is gone. I’m not an early riser so doubt I would have had your stamina to go back so early but I def would have done the driving around part. 🙂 And it paid off! Yipee! I love your table and those plates were a steal! What an awesome bargain! Beautiful table and the theme is so perfectly done with every detail! So glad you were successful to find the Queen of Hearts for I have done the same thing. Your table is so perfect for Valentine’s and cards. The lovely flowers add to the Queen centerpiece. I know your card companions will ooh and aah. Hope you will take a peek at my Valentine’s red and white table for you might enjoy it! Isn’t it a fun feeling to find something you love and realize it’s a fabulous bargain! Love the plates and love the tablescape. Perfect for Valentine’s Day or any day. I know the goodies are always a hit. I’m so glad you found what you left behind along with 2 others. I hate when that happens. I’ve since learned to buy now, return later. Lovely table settings. You got an awesome deal on those plates and yes the modern version reminds me of Sofia!! PS. I knew we’d be great friends when I read you waited in the parking lot for the store to open. Yep, been there done that!! Love this, very creative! I can see you waiting in the parking lot stalking the store! 🙂 Those plates are adorable, great find! The closest TM closed, and it was 50 min away. I was surprised! Always a fun place to bargain hunt! A, I wrote this comment a few days ago, but I couldn’t get it to go through. Finally! Alycia just have to tell you that this beautiful table setting was such an inspiration for VD! Love the queen of hearts motive, very creative and fun. Cute, cute and such a great bargain on the plates to set the table off. I love to play cards and play with friends anytime I can. I just told a friend to be sure and bring the cards for a trip with friends the last of March. Smart little centerpiece for the queen of hearts, it’s kind of like you, the queen of tablescapes. Can anyone help me? Or would someone be willing to sell me their set? Wonderful!! And the figurine!!!! Glad you were able to find one. Very clever to add the Hallmark hearts! Is there any way that the person who made this original post could e-mail me. It would be greatly appreciated!